Lists, Lists, Lists. What would we do without them? With our activity laden lives it is almost impossible to keep track of everything we must and should be doing without keeping lists. I find it particularly useful to have special lists for long term, recurring activities. For example, the list of what to do when the clocks change. Aside from the obvious, it is also time to change the batteries on smoke detectors. I also have a January list of things to do at the beginning of each year. At the top of that list is a review of my Will and Power of Attorney (POA) documents. Let’s face it, time flies by. Before you know it, years have passed, your life situation has changed and those documents are sorely out of line with what you would want if something happened to you today. So a quick review is an easy task to check off the list each January. Just do it now. If you are reading this and thinking that it doesn’t apply to you because you don’t have a Will or POA, think again. I was shocked to hear this week that studies show that 56% of Canadians don’t have a will, and 71% don’t have POAs. 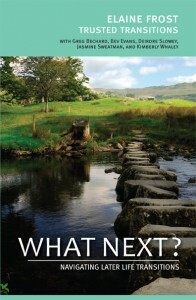 Just read the chapters in “What Next? Navigating Later Life Transitions” to get a sense of how quickly and badly things can go off the rails if something happens to you and you don’t have well thought out documents in place. And something unexpected can happen to any of us, at any age. So make this January the starting point for getting these things in place, and keeping them current over time.